Wow, we never thought that Pokémon would last this long. We remember playing it on our very first game boy. But it has, and we are so glad that we can share Pokémon Go with our kids. And let's be honest, it is an easy way to get them outside, and exercising. Your daughter has been running around yelling "Pika...Pika...Pikachu!" It is pretty funny watching her try to "Catch Em All" just like you did when you were her age. And while your favorite was Charizard (a fire dragon), hers is, of course Pikachu. You remember going through that phase too, but she, like you did, will figure out that there are other awesome Pokémon. You will let her go through her Pikachu phase. It's fine. It's just a phase. 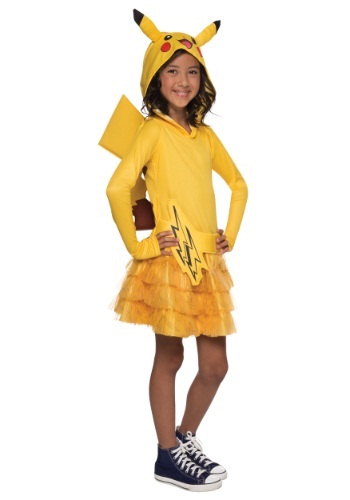 But during this phase get her this Girl's Pikachu Hoodie Dress, and let her show off her lightning personality. This dress will make let everyone she meets know how fun she is with such a happy yellow colored dress, and Pikachu's cute face on the hood. She will be the most popular kid in class when she shows off her Pokémon catching skills. It will be awesome to see how she grows as her love of Pokémon evolves. And she will be healthier from running around trying to "Catch 'Em All", and earn gym badges with her friends, and yelling "Pikachu, I choose you!"